Thanks to its modest price and compact chassis, it would be very easy to assume that the Electro-Harmonix Oceans 11 Reverb is just another basic reverb pedal with the usual selection of room, hall and plate reverbs. However, lurking inside this deceptively small box is a huge variety of awesome reverb effects, including very sophisticated sounds usually found in devices costing three, four or more times as much as well as excellent renditions of the aforementioned staples. 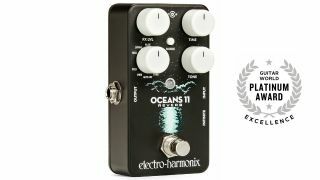 Whether you want outstanding versions of “bread and butter” reverb effects, complex and unusual special effects or a combination of both, the Electro-Harmonix Oceans 11 Reverb is a worthy and highly affordable contender for any pedal board large or small. FEATURES The lower left rotary switch knob on the Oceans 11’s front panel gives the strongest indication of the complexity lurking within this diminutive device. Here users will find 11 different settings that consist of hall, spring, plate, reverse, echo, tremolo, modulated, dynamic, auto-infinite, shimmer and polyphonic effects. Several of these effects — tremolo, modulated and dynamic — have three different sets of parameters that are selected with the mode switch. The mode switch also selects tap tempo divisions for the echo setting and engages either interval or mix edit parameters for the Poly setting. Other controls include an FX level, time (decay) and tone knobs, with the latter two also providing a secondary set of parameters that are accessible by holding down the mode button for about one second. A tails switch for selecting whether the reverb tails continue or are immediately cut off when bypass is engaged with the footswitch is located inside the pedal and is accessible by removing the rear panel. In addition to standard mono ¼-inch input and output jacks, the pedal features a ¼-inch infinite jack that enables users to control an infinite reverb tail with a momentary footswitch. The pedal can be powered either with the included 9.6-volt 200mA power adapter or a standard 9VDC center-negative power supply (no battery power option). The LED is sufficiently bright for any indoor and outdoor playing environment and illuminates in different colors (green, orange or red) and blinks or remains constant depending on which mode and function is engaged. Delay times for the echo setting can be set with the time knob or with a tap tempo function engaged by the unit’s footswitch or a momentary footswitch connected to the infinite jack. PERFORMANCE The sound quality of all of the effects is stellar, boasting smooth tails and pro studio-quality noise-free performance. The spring reverb setting is based on a 1962 Fender 6G15 reverb unit and delivers some of the best spring reverb effects you’ll ever hear. Echo combines delay and reverb, while tremolo applies a tremolo effect to both wet and dry hall reverb. Shimmer is an ethereal, octave-up reverb effect with a long, sustaining tail that produces a synth-like texture, and the polyphonic reverb applies two programmable pitch-shifts to the reverb tail to also generate complex, synth-like sounds. How complex are these effects? Let’s just say that they will even tide over the most discriminating reverb aficionados. While the Oceans 11’s various modes and functions may seem overwhelming at first glance, using and dialing in custom effect settings is fortunately very simple and straightforward. The pedal remembers the last mode setting for each applicable reverb type, although users will still need to adjust the FX level, time, tone and secondary settings to recreate specific effects on the fly. While there is no display for tweaking parameters with precision, the pedal encourages the lost art of using one’s ears and the display’s absence significantly keeps the cost in check.